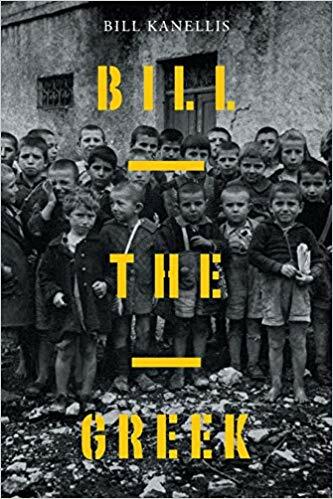 Bill the Greek by Bill Kanellis tells a harrowing true story of one boy’s experience in Greece during World War II, its aftermath, and the drawn-out process that brought him to the United States as an orphan adopted by a Greek-American couple in Montana. The description alone would catch the attention of any reader interested in history, especially Greek and diaspora history. The book is just over 40 pages, but should probably be ten times that in order to unpack all the various chapters of Greek history that are concentrated in this one young boy’s journey from orphan to adoptee. The book raises many more questions than it answers and hopefully there is a longer version in the works which will illuminate what exactly happened to the boy’s birth parents and relatives in Greece, why Bill and his brother were separated and not both adopted by the Greek-American couple, and what happened to the brother who was left behind in Greece. We also want to know if Bill ever returned to his home country, and what happened to the rest of the family in the years between his arrival in the United States and the publication of this slim volume? As a short story, the book is a compelling narrative, reflecting the child’s impressions of life over a very specific period of time, but mature readers may be frustrated that themes and issues were not explored in depth and further developed. The book clearly highlights the harshness and brutality of life during the war, especially for the children living under the appalling conditions of occupation. Moments and images that have stuck in Kanellis’ mind for over 70 years will also haunt the reader, reminding all to never forget and to also honor those who made the ultimate sacrifice. The book begins with Kanellis’ summary of Greece’s entry into WWII, the famous “Oxi” on October 28, 1940. As one by one the nations of Europe fell under the heel of Axis oppression, no one expected Greece, a relatively small nation, to stand up and derail the enemy’s plans. News of Greece’s victory against the fascist Italian forces in the mountains of northern Greece and Albania spread quickly via radio and soon covered the front pages of newspapers around the globe. The victory was not just for the people of the Hellenic Republic but also for Hellenes of the diaspora, especially those in the United States, and for the entire world. Kanellis’ book, however, focuses not on the broader history, but on the day to day struggle to survive that our grandparents very likely experienced in Greece during the war, and the dream of a better life in America. That struggle should not be forgotten since it led us to where we are today. The hope is that even more information will be shared before those generations of eyewitnesses to history are gone.